Frustrated with Emacs because you’re just not as productive as you are with your old editor? Copying configuration snippets from the Web in order to force it to work like what you’re used to, but running into problems with conflicting code or obscure error messages? It’s natural to get frustrated when you expect something should work a particular way and it doesn’t, or you’re used to working quickly and you have to slow down. “Why can’t I use Ctrl-X to cut? Why is it called ‘killing text’? Why doesn’t it work like __?” I know what that’s like; even after years of using Emacs, I sometimes still struggle to configure things that people who use other editors take for granted. Some differences seem easy to address with code you can get on the Net. But if you do that – if you give in to your initial discomfort – you may find yourself fighting more and more of Emacs as you go along, without the skills to properly understand or integrate your changes. It’s better, I think, to approach Emacs as a beginner. Empty your cup and let go of your expectations. Pretend this is your first editor. Go through the tutorial. Start with the basics. Try doing things the Emacs way. In the beginning, you might feel agonizingly slow. You may need to do this after hours instead of when everyone is counting on you to deliver a time-sensitive project. It’s okay to open up Vim or your previous editor so that you can get something done, while you keep learning Emacs in the background. It’s okay to use the menu and the toolbar while you get the hang of the most common keyboard shortcuts. As you become familiar with the system, you learn how to work within it. Slowly configure things. Get used to the changes before you introduce more. Eventually, you’ll understand the configuration snippets that other people post. Reading Emacs Lisp is the first step to being able to modify Emacs Lisp, and from there you can learn how to write Emacs Lisp. But you don’t have to start knowing that right away. Many people use Emacs for years before writing Emacs Lisp, and many people use it without customizing it. But if you start learning Emacs by getting frustrated with it and trying to force it to be what you want, you might never get to the point where you can enjoy it and work with it. 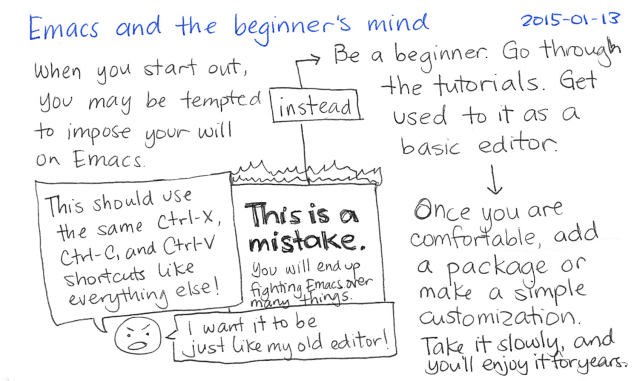 Be a beginner. Give yourself time and space to learn, even if you feel you’re learning slowly. Then, as you improve your understanding and skills, you’ll learn how to coax Emacs to fit you even better. The whole website itself is one big tutorial. Topics can be wide-ranging but it has a specific category for beginners. This list was put together by Marie Alexis Miravite. In addition, you might want to check out how Bernt Hansen uses Org, which is also pretty cool.